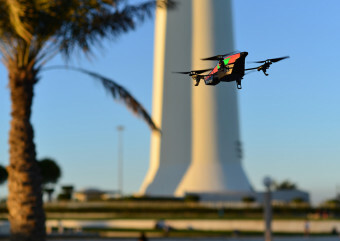 One of Appropriate IT’s research areas is robotics and artificial intelligence, which includes a topic that has taken on quite a bad reputation in recent times – drones. Why the bad rep is a whole another discussion. I can see a few of you rolling your eyes (no Colby, I am not thinking of you :)) and saying “Drones for Development: Really?” There is an explanation of why AI focuses on cutting-edge tech elsewhere on this site, so let us get back to the topic of drones. Can we create a system using today’s most advanced technologies that can allow this part of the world to leapfrog in the same way that they’ve done with mobile telephones in the last 10 years? Many of these nations have excellent telecommunications today without ever putting copper lines in the ground. Could we do the same for transportation? Imagine this scenario. Imagine you are in a maternity ward in Mali and have a newborn in need of urgent medication. What would you do today? Well, you would place a request via mobile phone, and someone would get the request immediately. That’s the part that works. The medication may take days to arrive, though, because of bad roads. That’s the part that is broken. We believe we can deliver it within hours with an electric autonomous flying vehicle such as this. This can transport a small payload today, about two kilograms, over a short distance, about 10 kilometers, but it is part of a wider network that may cover the entire country, maybe even the entire continent. It is an ultra-flexible, automated logistics network. It’s a network for a transportation of matter. We call in Matternet”. Yeah, ok…I confess Matternet is an awesome idea that will make any geek’s pulse quicken in excitement, so I am not immune to it. This cool tech is also being combined with a potential for social change, which means my heartbeat is probably breaking a few records already. AI’s Innovation Lab is currently neck deep in building a technology platform that adds an innovative twist to social accountability projects. The platform is piloting use of crowdsourcing to monitor health care service delivery in Uganda. As part of the project’s discovery and design phases, the project team (including yours sincerely) visited rural health centers in Apac district in Uganda. So I have seen first-hand how hard it is to reach some of these clinics. Trucks that bring medicines and medical supplies to these health clinics usually make one stop every month at the district headquarters, where supplies are sorted and further distributed to the rural health centers. If there is an outbreak of an infection or medical emergency in the district in the interim, there is no quick or easy way to get much needed medical supplies. In cases such as these Matternet can save lives. However, before we rush off to turn “leapfrogging road transportation” into the next silver bullet, let us consider Matternet in another context. In many countries, there is an army of young people who add to their income by providing delivery services for neighborhood shops. Take the case of India. Anything I need, whether it is a necessity or a luxury – medicines to food to magazines to DVDs to anything really – is only a telephone call away. One phone call. Any local shop will deliver whatever is needed through someone earning a secondary income by delivering goods. In this case, Matternet will remove this income-earning opportunity for youngsters, that too in a global climate where youth unemployment is already high and causing all sorts of social distress. If you were expecting me to play cheerleader on the basis of my pulse rate, I hope I did not disappoint you too much by playing the role of a bit of a wet blanket. Before we rush to implement any technology, it is imperative that we consider the various socio-cultural factors and provide thoughtful alternatives. For instance, one possible solution for youth who will lose their secondary income is to offer Matternet franchises they can buy and operate as local community hubs. These hubs will receive the drone-delivered packages and provide the last mile delivery service – that of getting it to various houses in the neighborhood. This is just one of many ideas that can be explored before we disconnect people from livelihood opportunities. Technology is indeed edgy and cool and…all sorts of adjectives can go here. Let us just be thoughtful about how we implement it.